Good Afternoon! Another great one here in RBNY land. Then again, any day where a hurricane isn't slamming into where you live is a great one. But nevermind that! The Red Bulls are back in action today, @Rio Tinto Stadium (located in picturesque Sandy, Utah), against defending MLS Champion Real Salt Lake (9:00pm ET, MSG). The Red Bulls a riding a 2 game winning streak and will be looking to win their 5th away game of the year. Real Salt Lake, on the other hand, is coming off a dissapointing 0-0 tie against the hapless Toronto FC. Before that, they played their part in one of the most insane games I've ever seen - a 5-4 loss against Mexico's Cruz Azul in Concacaf Champions League actions (check out the highlights here). Rest assured, the team from Mormon Country is looking to get back to winning ways. Playing on their home field, RSL would be a tough test for a full strength Red Bulls team. The test just got even tougher as the Red Bulls will missing four regulars from the lineup, due to International call-ups. RSL will be missing the ever dangerous Alvaro Saborio, but, position by position, the advantage (one could argue) goes to the home team. With all that in mind, let's get to some predictions! then Javier Morales gets one for the Mormons. I'm going to have to predict a Red Bulls loss in this one. The Red Bulls will be missing four starters from last weekend's game, which will be their undoing. While RSL will be missing Saborio, Findley is very capable of putting goals in in MLS play (he should never play with the USMNT again, however) The Red Bulls will also have to deal with the altitude that left them gasping for air in last year's away game, from about the 75th minute. A draw might be a posibility (as happened last year), but I'm thinking loss. Final score: RSL 2, Red Bulls 0. And I'll be hoping that I'm way wrong, of course. A month ago, the Red Bulls were missing four men to international duty, went into BMO field and took down an opponent who hadn't lost at home in ages. Tonight, missing the same four men, they again find themselves on the road against a team who hasn't lost at home in ages--RSL has gone unbeaten in 21 home matches. The main difference here is that Toronto is a mediocre team, and RSL is the current MLS Champion and legitimate contender again this season. Sorry, but Sutton, Stammler, Kandji, and Borman are not Bouna, Marquez, Richards, and Miller (and yes, I am in the apparent minority that thinks Miller is better than Borman at left back). 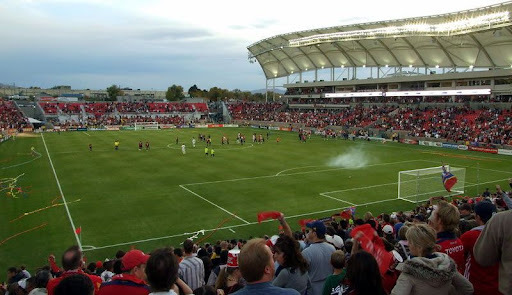 RSL at home will be too much for a Red Bull team screwed by MLS' apathy towards FIFA dates. We'll have to wait until next week to get to 40 points on the season. I see a 2-1 defeat. Angel adds to his tally. Another Saturday, another chance to send a message to the league that the Viking Army is on the march leaving no surviviors in its wake. RSL will be a tough test, especially in the mountains. That said, Red Bulls look like they are coming together. I am predicting another road win. 3-1. Henry with two. Lindpere with the other. A big thumbs up to Joel for choosing RBNY over Estonia. He is definitely the man. And as sinful as this is, I will be rooting for DCU to beat Columbus; helping us close the gap with the Crew as we hunt them down like the marauders the Viking Army are! YSM must have a smile right now. Rooting for DCU? Say it ain't so YSC! Alrighty then. We'll be back in a day or two with our insight on whatever happens today. Viper Out!